Diagonal frameless wall cabinets are a popular and effective way to maximize storage space and style in the corner of your kitchen or bathroom. However, their design places the door and sides at a 45-angle rather than the standard 90-degree angle, which means standard hinges just won't do. Our diagonal concealed hinges are specially designed for these cabinets so you can enjoy all their benefits while having a working door. We have European-style hinges from Salice, Blum and Grass for both overlay and inset applications to meet the demands of your next commercial or residential project. Front corner hinges can be found at both plus-45 and minus-45 degree angles, depending on whether you want your door to open from the right or left side. Alternatives are also available for an assortment of attachments and degrees of opening, and you can pick between free-swing, self-close and soft-close hinges. 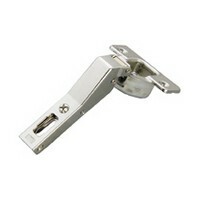 Hinge wedges are also available if you need a custom angle on your cabinet. We take pride in being the most reliable supplier for your woodworking needs, and our diagonal 45-degree hinges are more than up to the task. With nearly 20,000 products in stock and free shipping for a year with a PRO membership, you can count on WoodworkerExpress.com for fine quality at a bargain price.